The average person may be used to serving red wine at room temperature, and white wines out of the refrigerator, but most wine snobs will tell you that wine is more enjoyable when served at a temperature that best brings out its flavors, aromas, and structure (that's wine-speak for how it feels on your tongue). Determining the temperature that a bottle of wine should be served at requires knowledge of the wine itself, and a bit of science. For example, a wine's density (or "body") matters when it comes to serving temperature. Lighter reds and whites, such as pinot noir and sauvignon blanc, should be served at lower temperatures than heavier red and white varietals like cabernet sauvignon, merlot, or chardonnay. 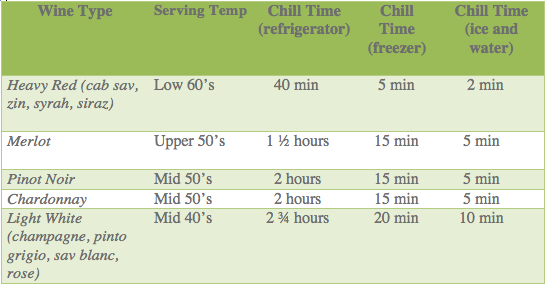 *Times are for wines at 70°F, for wine that if at 80 °F, add 30 minutes in the refrigerator, 5 minutes in the freezer, and 2 minutes in ice and water.